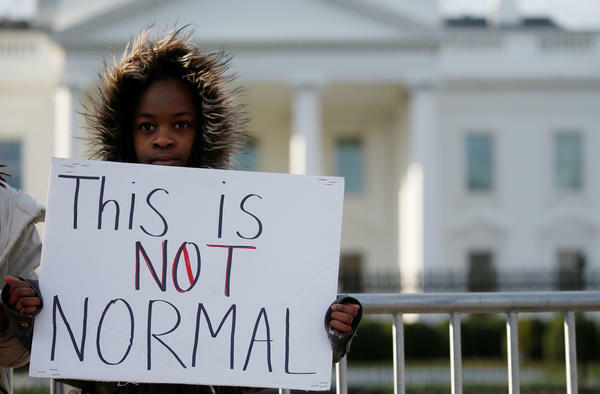 Eleven-year-old Naomi Wadler of Alexandria, Va., was among the young people who rallied the crowd in Washington, D.C.
A student from Marjory Stoneman Douglas High School in Parkland, Fla., where 17 people were killed in a shooting last month, joins the protest in Washington. 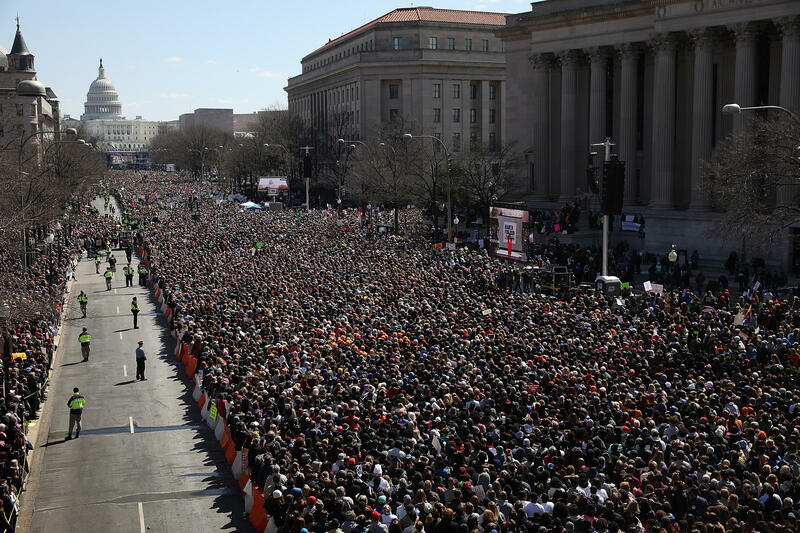 Hundreds of thousands of people came to Washington to send a message to politicians on every level. Taurica Haskins (left) is comforted by her husband, Alden Haskins Jr., as they arrive at the Washington rally. 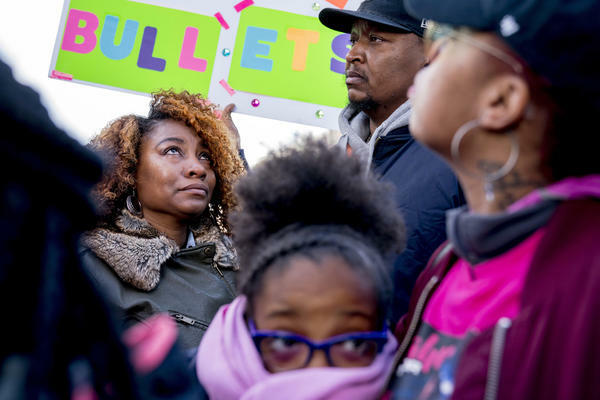 They were among those attending in memory of Jamahri Sydnor, 17, who was killed by a stray bullet in Washington, D.C., in August 2017. 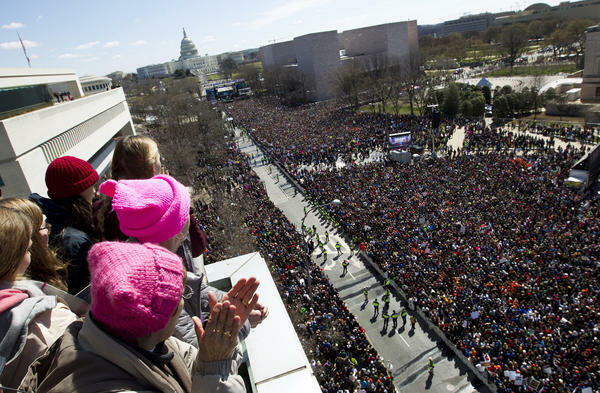 People on the balcony at the Newseum cheer the protesters on Pennsylvania Avenue as they look toward the stage near the Capitol in Washington. 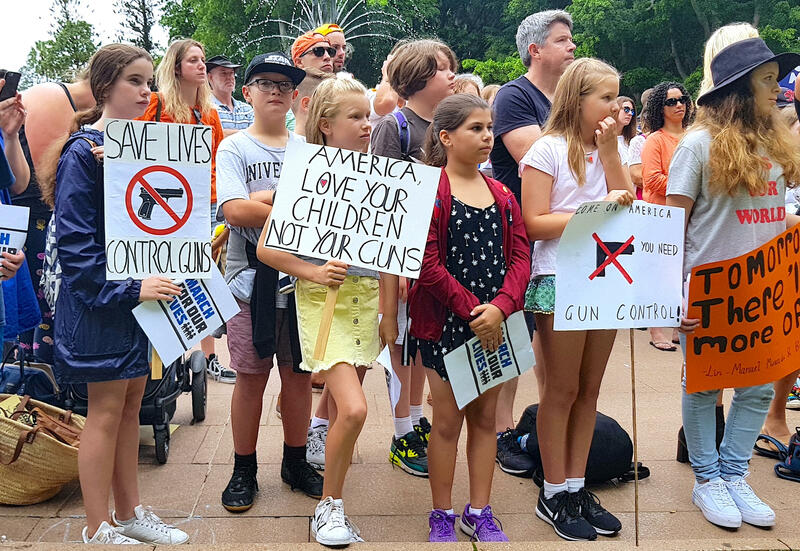 Many students and parents traveled to Washington from Parkland, Fla. 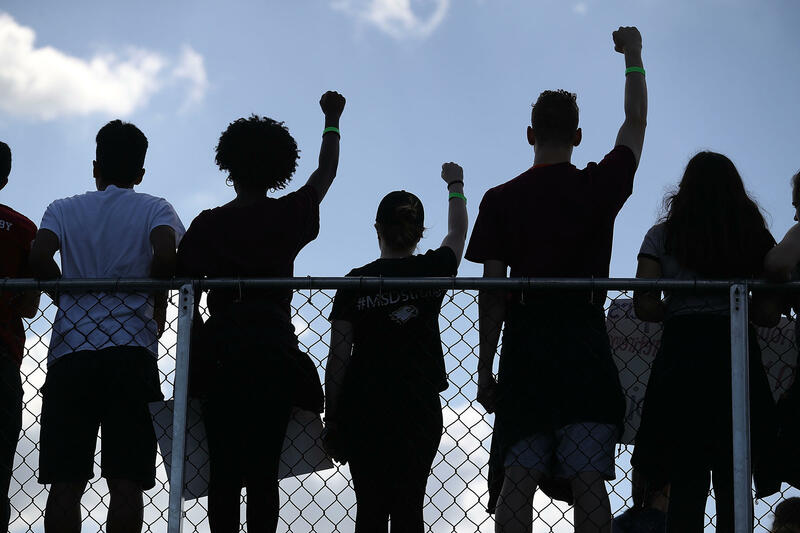 It was the shooting there at Marjory Stoneman Douglas High School that sparked the recent gun control activism. 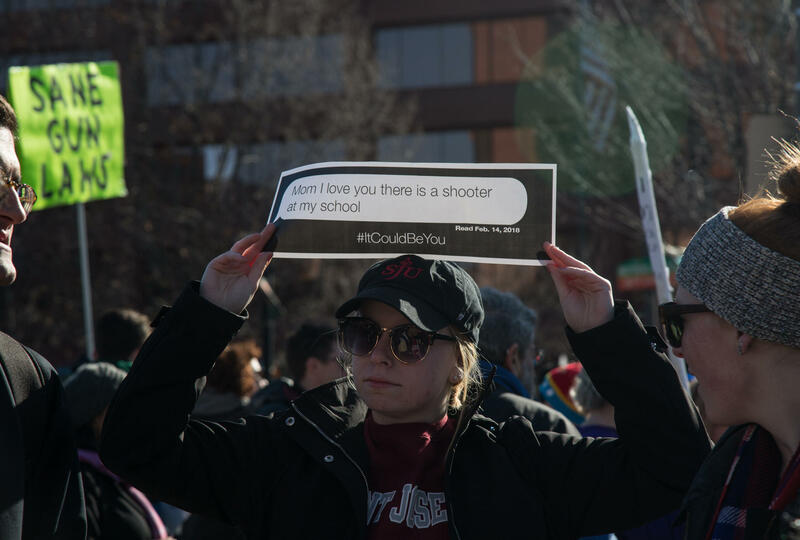 The crowd on Pennsylvania Avenue in Washington held many signs with one common message: "Never again." 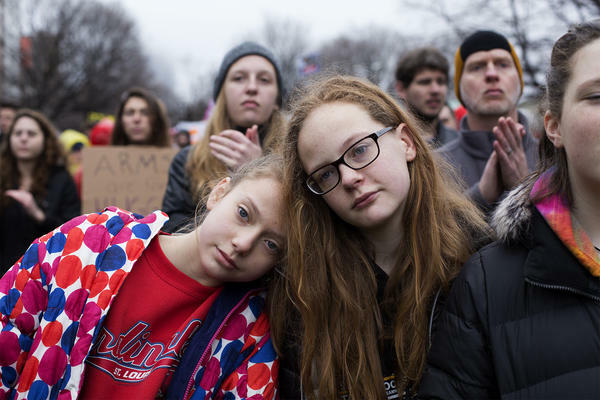 People of all ages attend the Washington rally, which was organized by students frustrated by what they say is the inaction of adults. 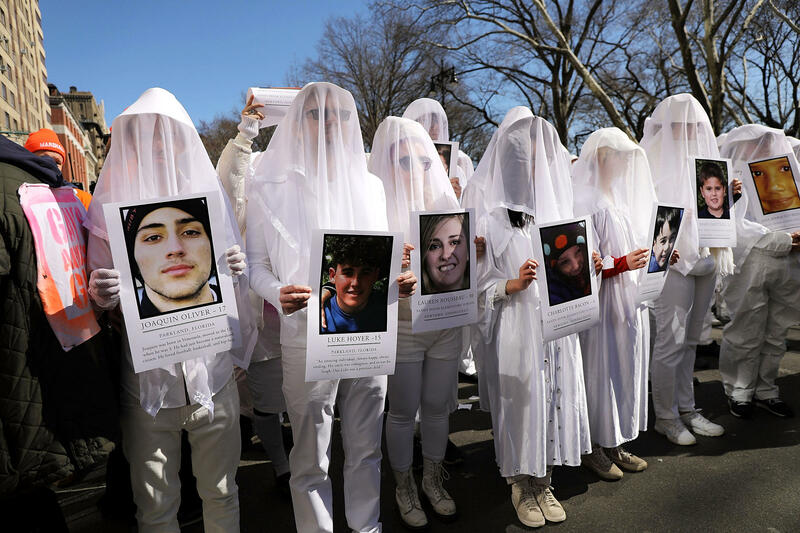 Protesters hold pictures of victims of gun violence as thousands of people take to the streets in New York City. 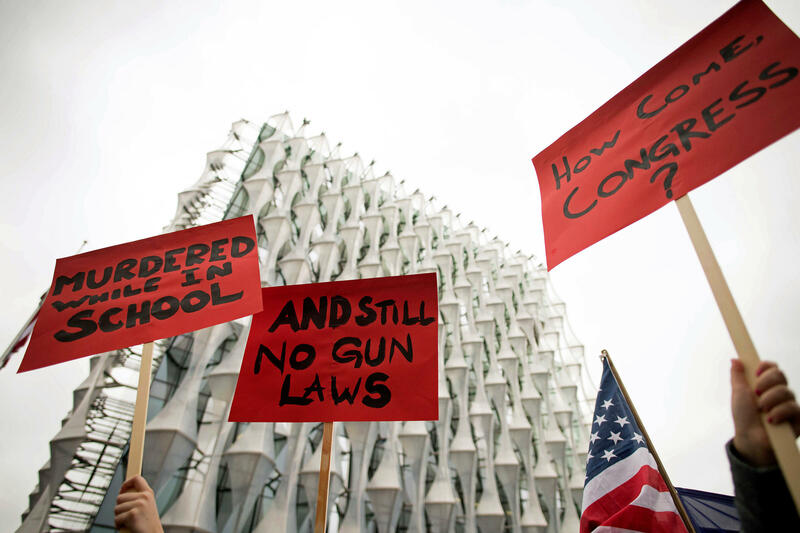 The gun control protests went international: Demonstrators hold up signs outside the U.S. Embassy in London. 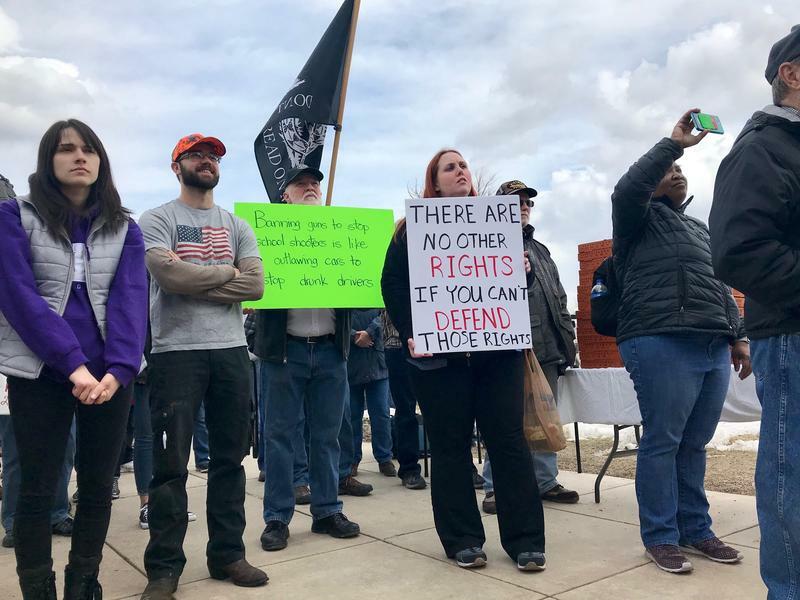 Demonstrators turn out for a Cincinnati protest, one of more than 800 coast to coast on Saturday. Protesters line Pennsylvania Avenue during the "March for Our Lives" rally in support of gun control in Washington on Saturday. Isabelle Braeske, 12, and Madelaine Province, 11, listen to "March for Our Lives" speakers after a march through downtown St. Louis. Students from Clayton High School get ready for the "March for Our Lives" event in downtown St. Louis. Mitali Sharma (center) marches with Clayton High School classmates in downtown St. Louis. 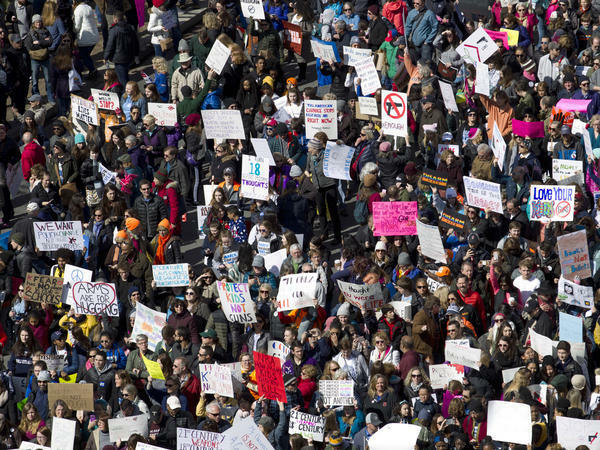 Protesters and speakers at the massive Washington, D.C., rally called for an assault weapons ban, limits on high-capacity magazines and universal background checks. 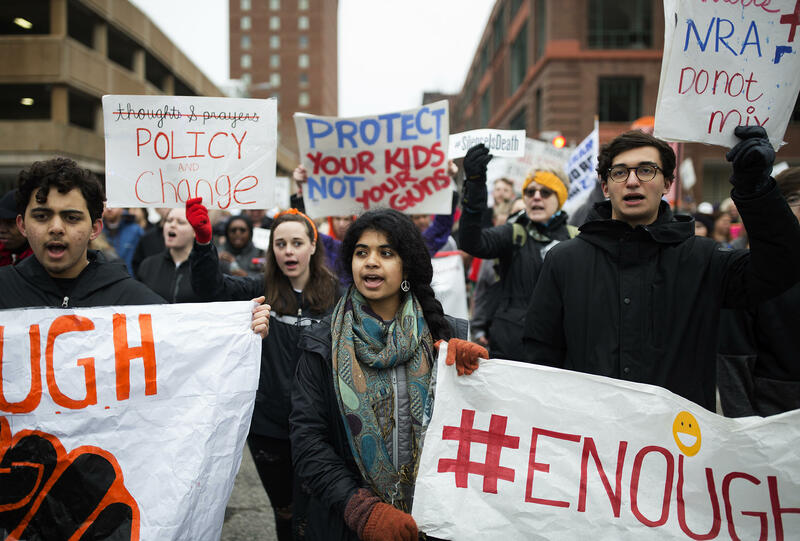 Students from all over Massachusetts and New England lead a large march down Columbus Avenue in Boston. 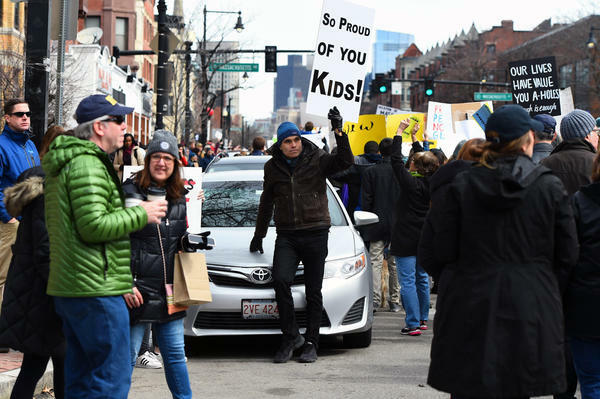 In Boston, protesters marched from Madison Park high school in Roxbury to the Boston Common. 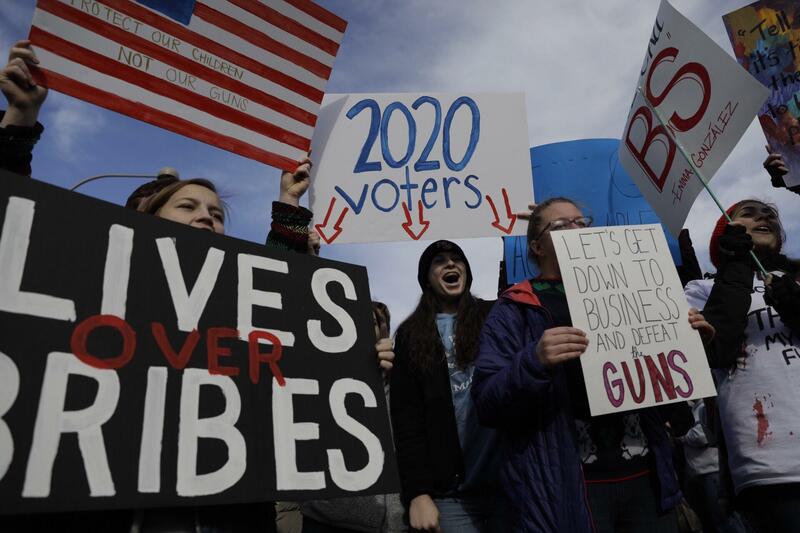 Susan Getis, 17 (from left), Leyla Kolbai, 17, and Jilian Donahue, 18, are all seniors at Riverside High School in Leesburg, Va.
Organizers of Boston's march say that although Massachusetts has some of the strictest gun laws in the country, it's not enough. The march in Washington stretched down Pennsylvania Avenue to the Trump International Hotel (the tower-like structure at left in the distance). 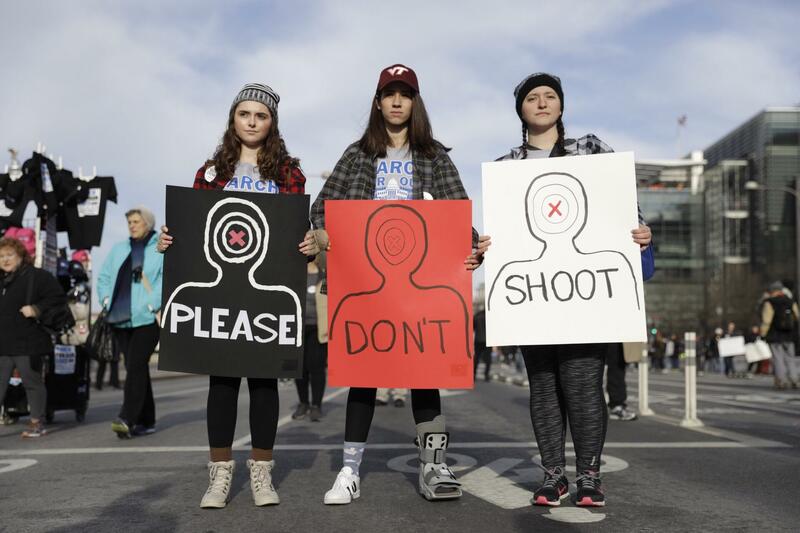 Jesse Pettibone, 23 (center), participates in the Seattle "March for Our Lives." "I'm here today because youth, queer people and people of color are often the victims of gun violence, and we need to disarm that hate now," Pettibone said. 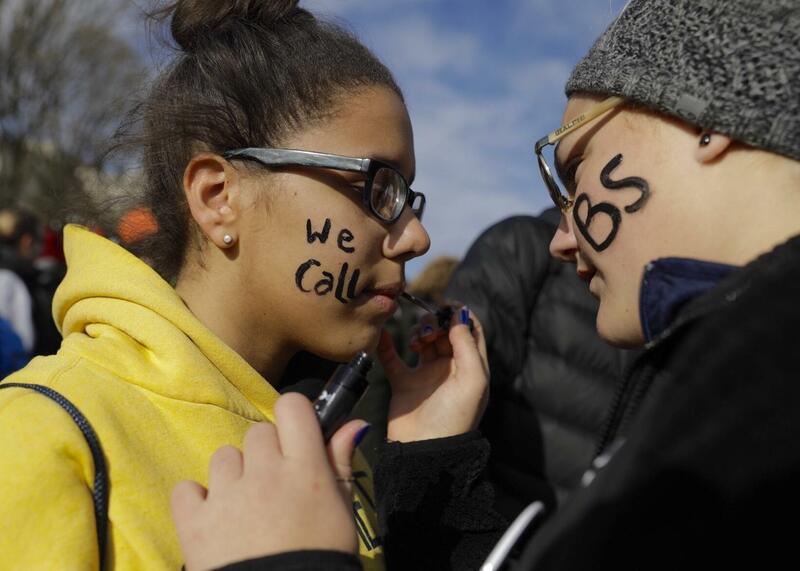 Abby Keller, 15, uses black lipstick to write "we call BS" on 15-year-old Kendra Walker's face. 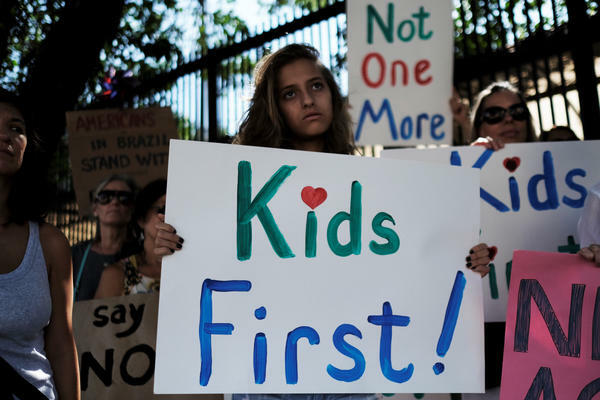 They are both from Fauquier County, Va.
People take part in the "March for Our Lives" rally outside the U.S. Consulate in Sao Paulo, Brazil. 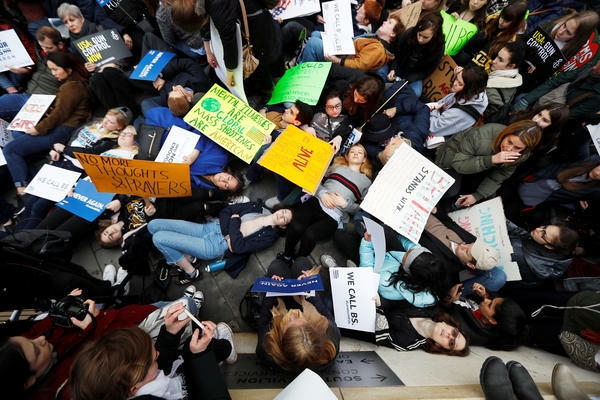 Protesters stage a "die-in" during a demonstration in favor of tighter gun control in the United States, outside the U.S. Embassy in London. Marjory Stoneman Douglas High School students hold their fists up in the air as they participate in the March For Our Lives event at Pine Trails Park before walking to the high school in Parkland, Florida. 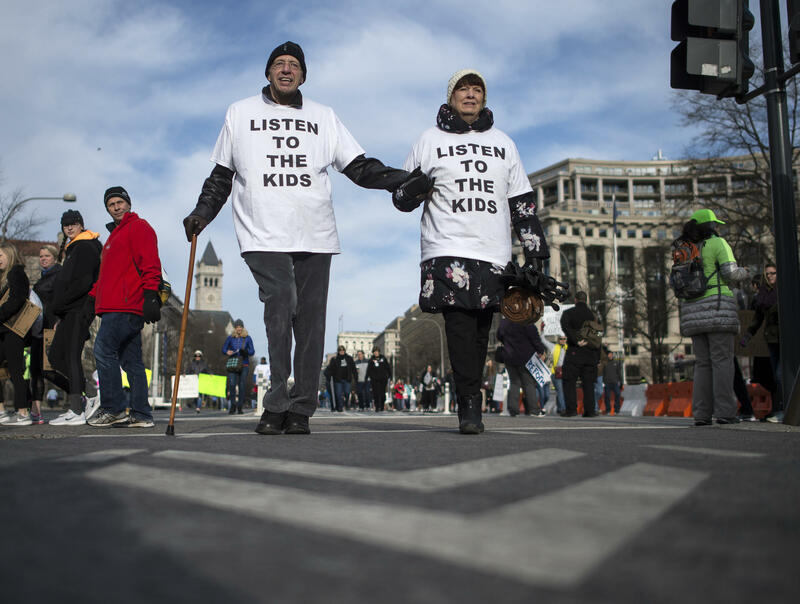 Gun reform advocates line Pennsylvania Avenue while attending the March for Our Lives rally. 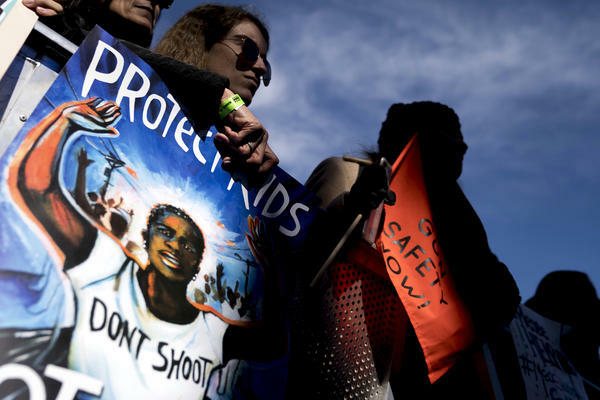 Young activists stand before marching during the March for Our Lives rally in Los Angeles, California. School children hold placards during a rally to show solidarity with U.S. students in their attempt to end gun violence in America, in central Sydney, Australia. Kashyia Smith, 12, from Wisconsin, poses for a photo in front of the White House. 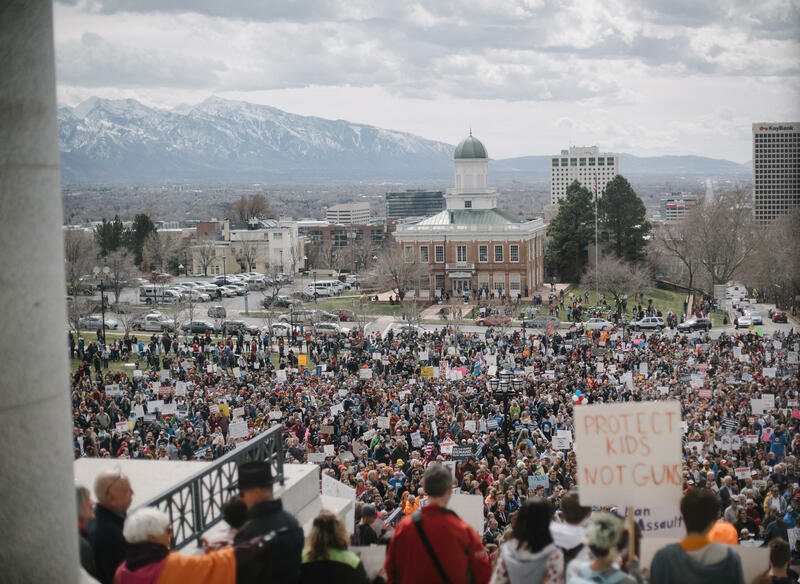 Saida Dahir, a 17-year-old junior, performs her slam poetry on the steps of Utah's Capitol. Student protesters gather outside West High School in Salt Lake City, Utah. 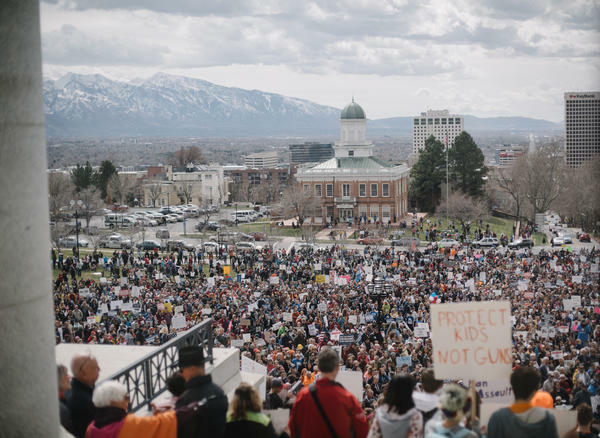 8,000 Utahns protest outside the Capitol. 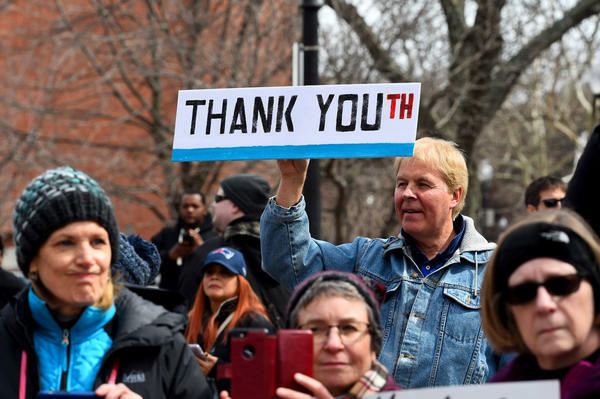 Teens got creative with their signs at the Philadelphia "March for Our Lives". U.S. Rep. Sheila Jackson Lee (center left) and student organizers lead the "March for Our Lives" in downtown Houston. 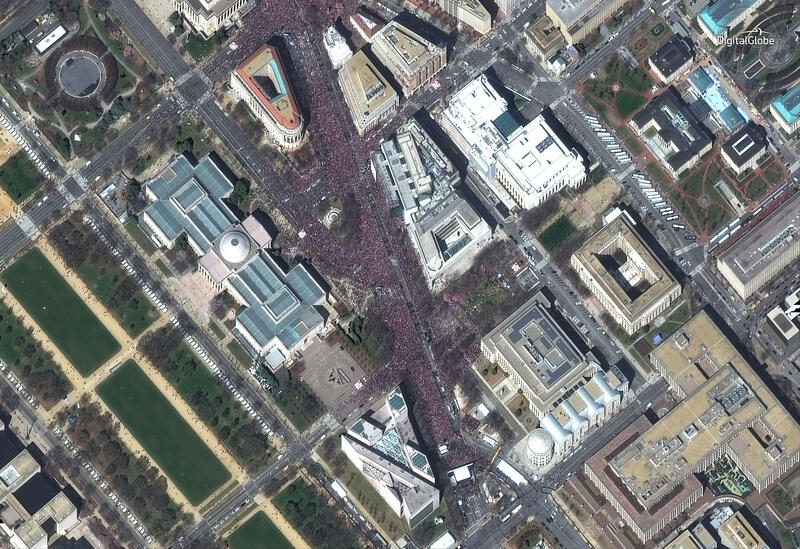 This is a satellite image of the "March for Our Lives" rally in Washington, D.C. In Washington, D.C., Parkland survivor Emma Gonzalez held the stage for more than six minutes, the amount of time the gunman carried out his deadly assault on her high school. 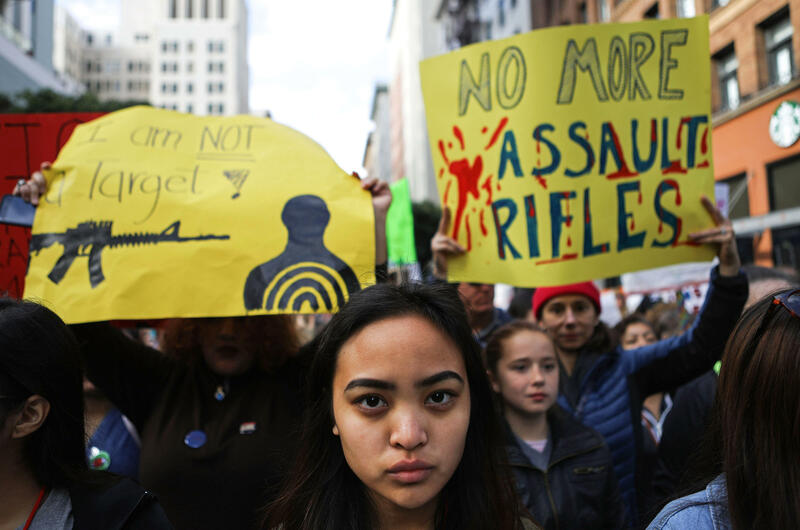 The "March for Our Lives" protest in the nation's capital was organized by students after 17 people were killed in a mass shooting at Marjory Stoneman Douglas High School in Parkland, Fla., last month. "I think it's something that if any politician pushed in general, they would really have an easy time getting re-elected because they would be, they would show that they're practicing what they preach and are trying to be leaders in their own right, but right now I think in Washington, we're not seeing that," David Hogg, one of the survivors of the Parkland shooting, told Weekend Edition Saturday. 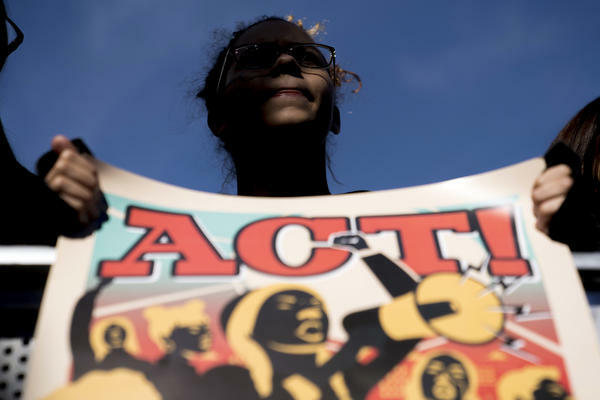 The march officially began at noon, but protesters started gathering along Pennsylvania Avenue near the U.S. Capitol building early Saturday morning; the event's organizers expected the turnout to exceed 500,000 participants. 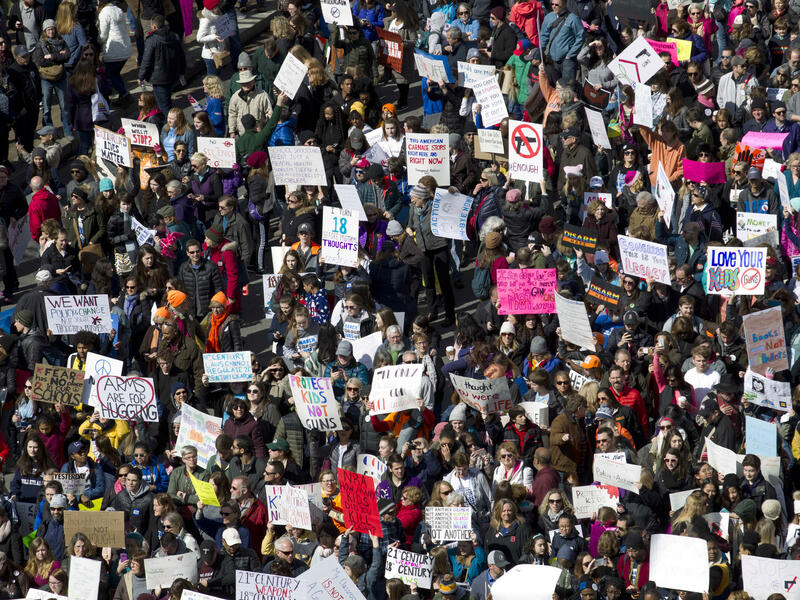 The event in Washington was one of more than 800 coast to coast to push for stricter gun laws. 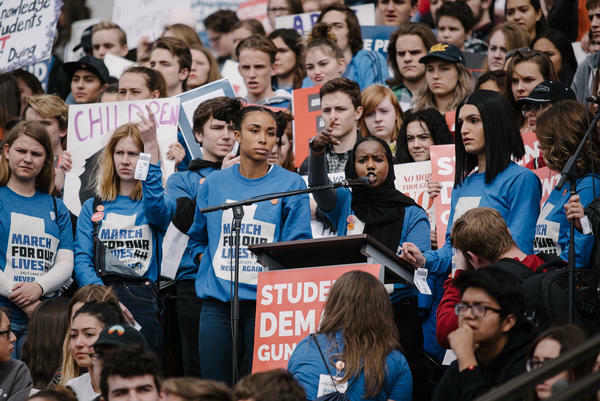 In the U.S. capital, chants of "vote them out" rang out in between dozens of student speakers from elementary to high school age, including several survivors of the Parkland shooting as well as Martin Luther King Jr.'s granddaughter. There were also performances by Jennifer Hudson, Miley Cyrus and Ariana Grande. 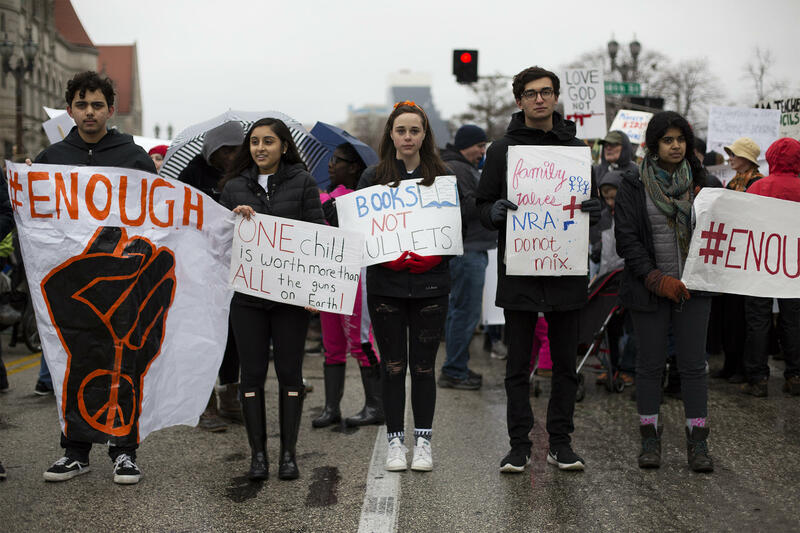 "Politicians either represent the people or cannot," said Cameron Kasky, a Marjory Stoneman Douglas student who survived the shooting. "Stand for us, or beware, the voters are coming." 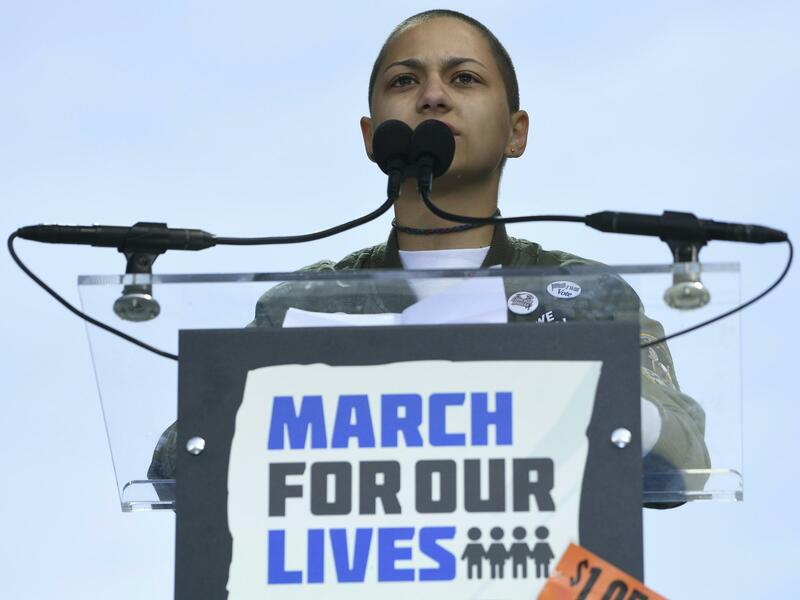 To close out the rally, Emma Gonzalez, a Parkland survivor who has become one of the main faces of this movement, delivered an impassioned speech in which she named each of the 17 victims. Then, as tears streamed down her face, Gonzalez defiantly held the stage in silence for the duration of more than six minutes, the amount of time the gunman carried out his deadly assault on her high school. Protesters chanted "never again." Then, a timer beeped. "Since the time that I came out here, it has been six minutes and 20 seconds," Gonzalez said. "The shooter has ceased shooting and will soon abandon his rifle, blend in with the students as they escape and walk free for an hour before arrest. Fight for your lives before it's someone else's job." Edna Chavez, a 17-year-old from south Los Angeles who lost her brother Ricardo to gun violence when he was in high school, prompted the D.C. crowd to chant his name. "It is normal to see flowers honoring the lives of black and brown youth that have lost their lives to a bullet," Chavez said. Meanwhile in her hometown, thousands rallied in downtown L.A., marching from Pershing Square to Grand Park. Featured speakers included Mayor Eric Garcetti and comedian Amy Schumer. Garcetti laid out California's bans on assault rifles and other gun control measures as a model for federal legislation. "We stand together for your senselessly slain classmates and friends and say this has to stop!" Schumer, a cousin of Senate Minority Leader Chuck Schumer (D-N.Y.) who also attended the event, said in support of the Parkland shooting survivors. 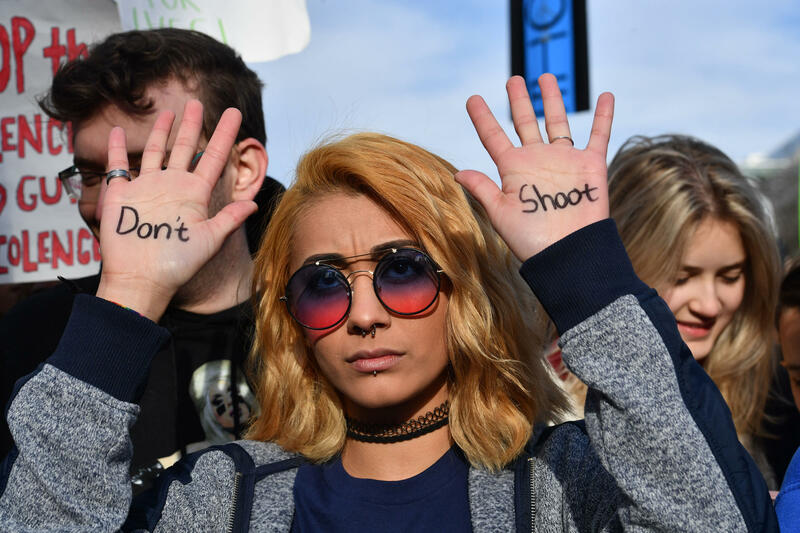 Elsewhere, demonstrators in Chicago focused on the daily violence young people face in a city long plagued by deadly shootings. In a packed Union Park, speakers called for greater investment in communities and schools, reports member station WBEZ's Linda Lutton. 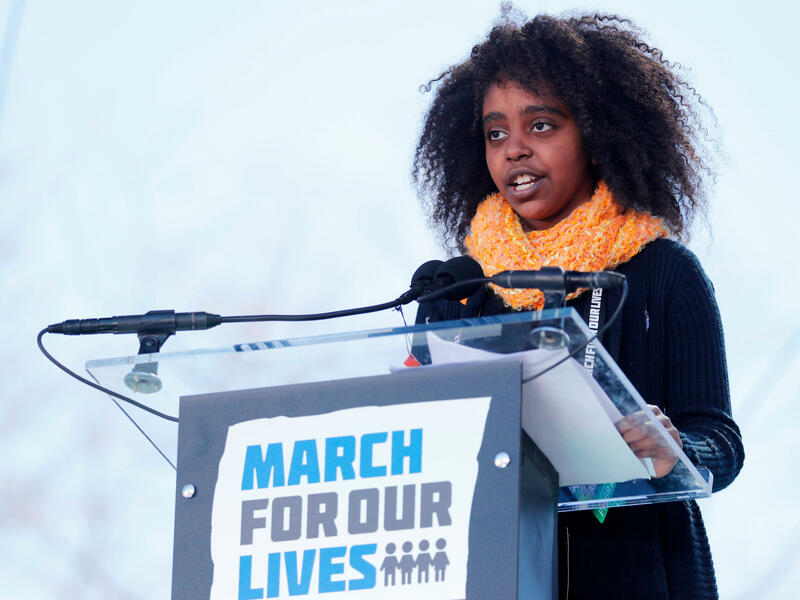 Activist Amina Henderson said Chicago's youth stand in solidarity with the Parkland students, but that "Gun control is not the only thing that we need. We need things to prevent these things from happening." 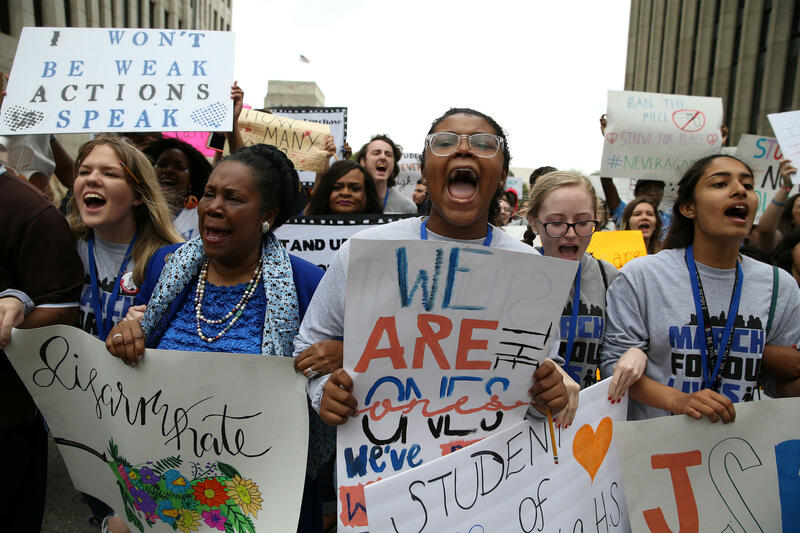 Saturday's demonstrations follow a national school walkout on March 14, exactly one month after the Parkland shooting, in which students across the country walked out of classes for 17 minutes to honor the 17 victims in Florida. President Trump, who was in Florida for the weekend at his Mar-a-Lago resort, had yet to weigh in on Twitter about the protests as of Saturday evening. After the Parkland shooting, Trump held a number of listening sessions with students and even floated the idea of raising the age of gun ownership to 21 and tightening background checks. But in the end, the administration didn't push for any bold measures. 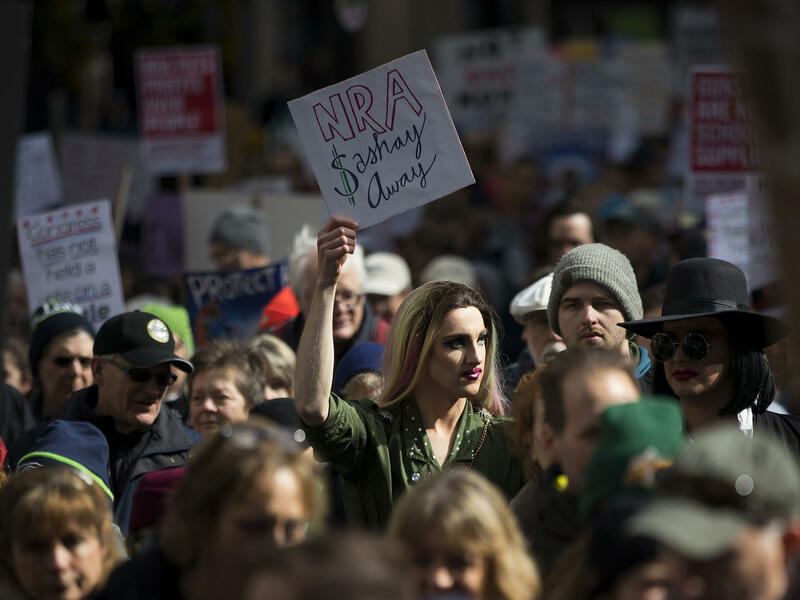 However, on Friday, the Justice Department proposed a plan to ban bump stocks, which are devices that allow a semiautomatic weapon to fire like a machine gun. 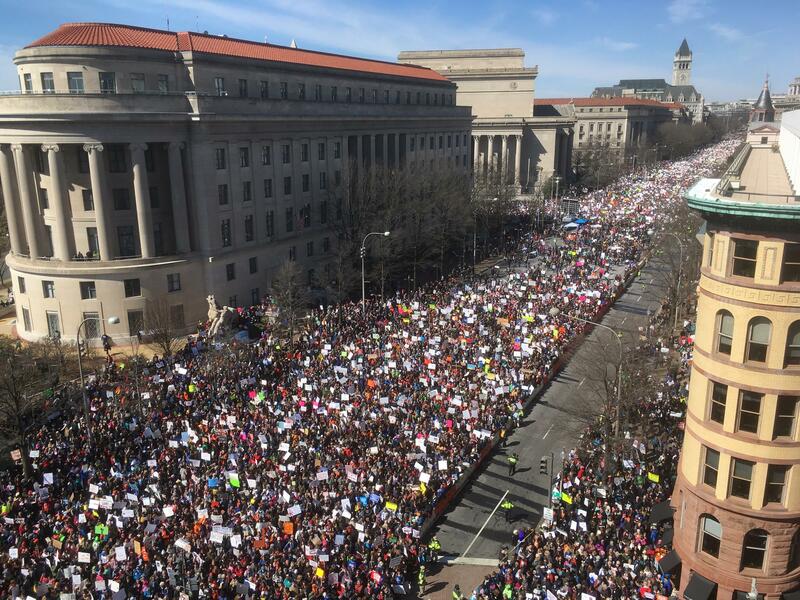 "We applaud the many courageous young Americans exercising their First Amendment rights today," White House deputy press secretary Lindsay Walters said in a statement. "Keeping our children safe is a top priority of the President's, which is why he urged Congress to pass the Fix NICS and STOP School Violence Acts, and signed them into law." Former President Barack Obama said on Twitter that he and Michelle Obama were "inspired" by the protests. Speaking at an event in Japan on Sunday, Barack Obama noted that the March for Our Lives events were "duplicated all around the world. And this was all because of the courage and effort of a handful of 15 and 16 year olds. "That's a testimony to what happens when young people are given opportunities and I think all institutions have to think about how do we tap into that creativity and that energy and that drive," he said. The former president also said that "a lot of our problems are caused by old men — no offense, men who are old." 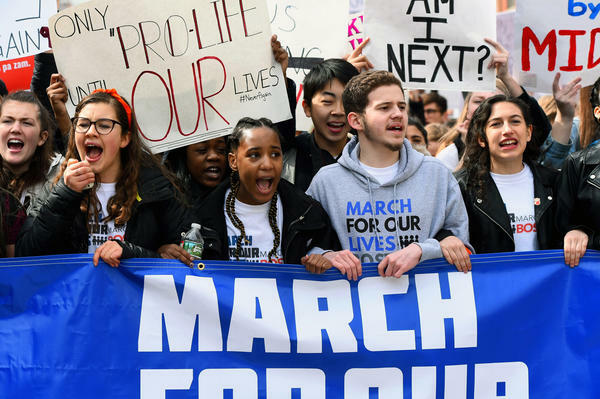 Pope Francis, without directly acknowledging the March for Our Lives, used a Sunday service to encourage young people to "shout." " 'There are many ways to silence young people and make them invisible. Many ways to anesthetize them, to make them keep quiet, ask nothing, question nothing. There are many ways to sedate them, to keep them from getting involved, to make their dreams flat and dreary, petty and plaintive,' he said.
" 'Dear young people, you have it in you to shout," he told young people, urging them to be like the people who welcomed Jesus with palms rather than those who shouted for his crucifixion only days later. 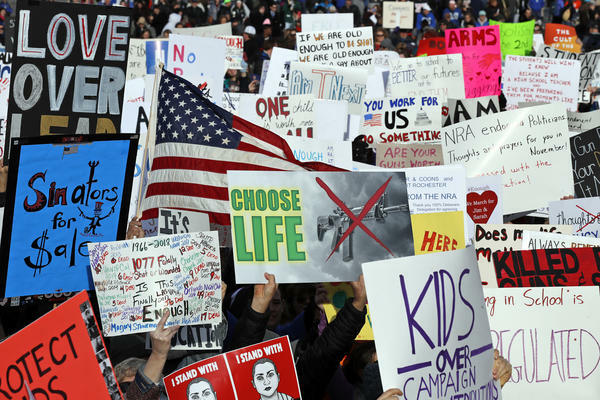 "While Francis did not mention Saturday's marches in the United States, he has often condemned weapons manufacturing and mass shootings." 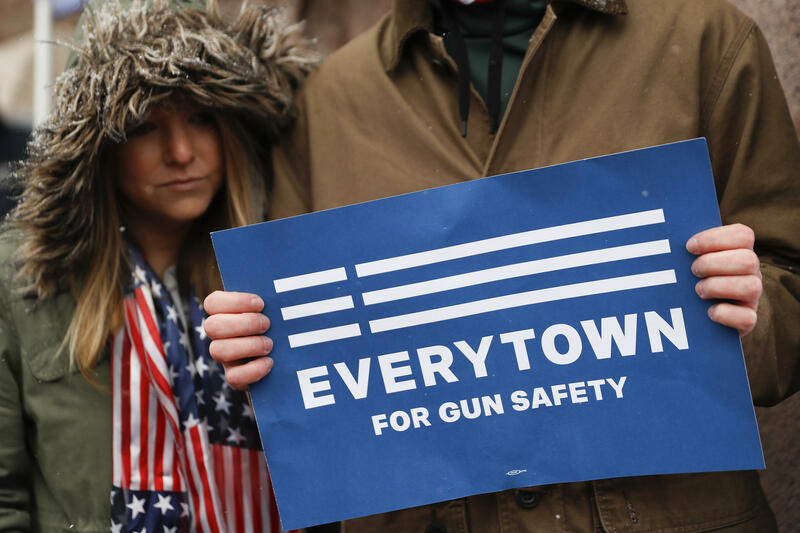 Even as momentum for tighter gun control seems to reach historical levels, the AP also found that most people don't believe politicians will take action. 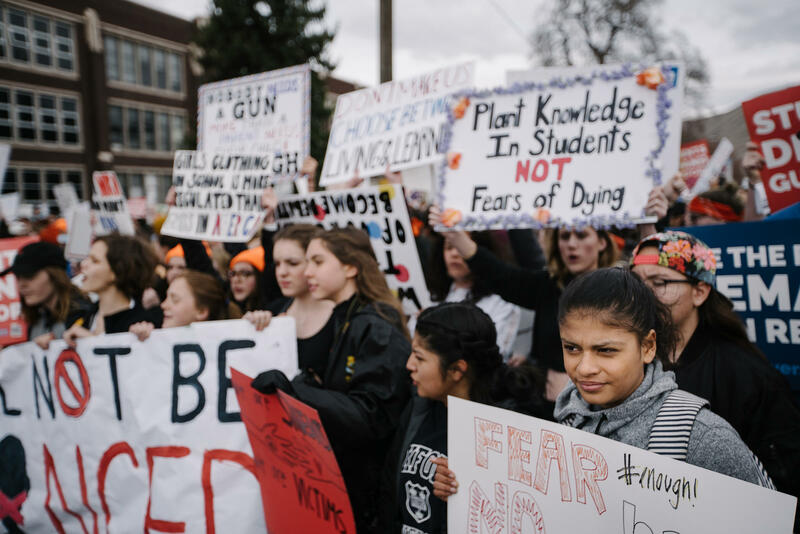 Student activists like David Hogg say that their generation's action will be the tipping point for change on guns. "At the end of the day, what our generation is fighting for is not only for us, the kids that are alive right now, but the future of America, we can and we will outlive our opponents because they are old and they are stuck in their old ways," Hogg says. "We will change the face of America with or without our opponents."